Keep an eye on site electrical data, UPS device status and logged power-related events, such as blackouts, brownouts and overvoltages. Reboot locked network equipment remotely without disrupting power to other devices when using the TLNETCARD with controllable outlets or remotely switchable outlets available on select Tripp Lite UPS systems. Tiered access allows three levels of permissions to be assigned to users for monitoring or controlling the UPS. If an electrical or UPS-related problem occurs on-site, youâ€™ll be notified immediately via email or SNMP trap. 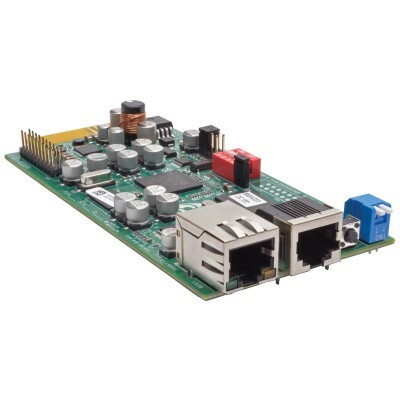 The TLNETCARD lets you configure and schedule automatic UPS-driven actions, perform UPS-related tests and shutdowns, upgrade firmware and upload configurations from the web interface. Multiple protocols are supported, including IPv6, HTTP, HTTPS, SMTP, SNMPv1, SNMPv3, Telnet, SSH, FTP, DHCP, BOOTP and SCP. DHCP/manual configuration support enables network settings to be assigned automatically or manually. - The TLNET Shutdown Agent software enables shut down of remote Operating Systems over the network.